If you have recently decided to sell your home, you are faced with not only preparing it for winter but also preparing it to be viewed by potential buyers during the winter. Selling in the winter is much different than selling in the warmer months. 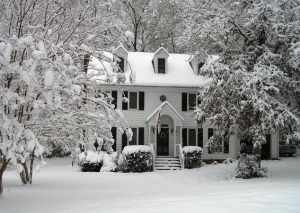 There are some important factors to consider when selling your home in the winter. The first thing you need to do when listing your home in the winter is make it accessible for potential buyers and their agents. This includes removing any snow from around the property and most importantly on the walkways. If you have already moved out of your home, you should take the proper steps necessary to ensure that your walkways are clear and free of any ice. Leaving your walkways covered with snow sets an unwelcome town and tends to make the property look unappealing to potential buyers. Buyers who pull up to an unshoveled home may see it as sad and abandoned and they may also think that because the property is not being cared for they can offer a lower price. Not clearing snow from sidewalks and driveways also makes them appear to be smaller than they actually are. Taking the time to properly clear all of the walkways and driveways will show buyers the full extent of the parking space. The process of clearing snow may seem tedious and unnecessary to many sellers, but doing so will offer buyers the chance to see all of the extra details that may miss due to the snow. Do you have an extended deck or patio in the back, take the time to clear all of that as well. Staging the exterior of your home is just as important in the winter as it is any other time of the year. Take the time to show off any special landscaping or extras that can be found on your property. Doing this can make the difference between selling your home and having it sit the entire winter. If your property includes a pool, but it is covered for the winter, be sure to provide your realtor with pictures of it in warmer months. This will help show prospective buyers what they are buying. Do not be discouraged if you decide to list your home in the winter, plenty of buyers will take the time to view properties in the winter if it something they are interested in. In many cases buyers in the winter tend to be more motivated than those looking during warmer months. Instead of seeing snow as a problem, you can use it to help increase the appeal of your home. You should also make the inside of your home as bright and appealing as possible, this will help detract from the dreary weather that may be taking place outside.